We do have wind turbines and solar power cells to produce green energy, but so far no one really succeeded in exploiting the enormous energy ressources within the ocean waves. The small entrepreneurial company Crestwing, based in Frederikshavn, is changing that fact, launching their unique wave energy converter. Since 2005 Crestwing has developed, built and thoroughly tested the plant in different shapes and sizes. The basic construction and technique in the wave converter was invented by engineer Henning Pilgaard, who dedicated his life to defending and developing renewable energy. Sadly, Henning Pilgaard passed away two years ago, but his ideas and life’s work is carried on by his wife, Ruth Bloom. - We keep on struggling to work for a fossil free society, developing and fine tuning this unique plant with so much untapped potential, Ruth says. Friday, September 7th 2018 was a remarkable day for Ruth and for Crestwing. That day, the wave plant was officially launched, and named “Tordenskiold”. During the following two years, “Tordenskiold’s” construction, anchoring and not least power take off will be closely followed, measured and analyzed by researchers and experts. After the testperiod the power plant will be ready for commercial sale to energy companies. Crestwing separates from other wave plants by taking advantage of power from the atmosphere pressure of 10 ton pr m2. The construction consists of two pontoons hinged together, which allows them to move in relation to each other. The WEC lies as if glued to the surface of the ocean and is forced to move with the wave. In principle, the wave is being slowed down by a break between the two pontoons. 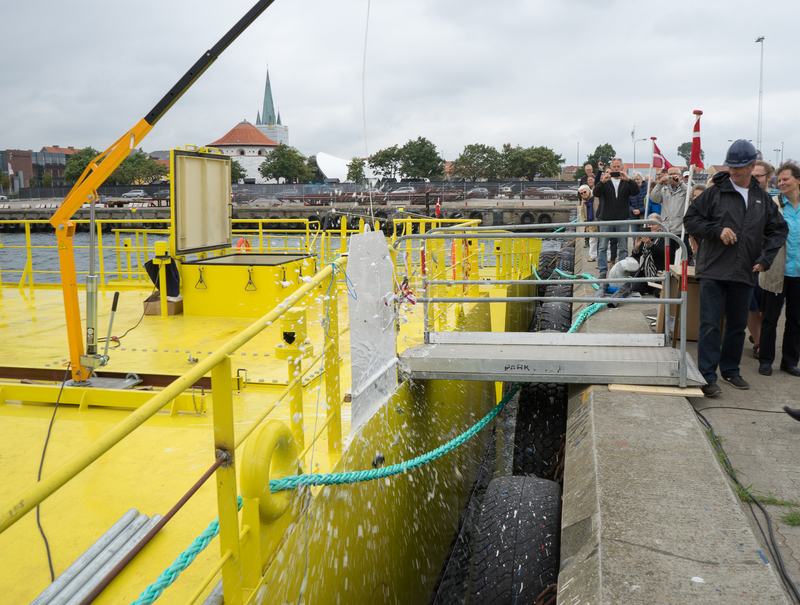 “Tordenskiold” has achieved its design through numerous physical tests at Danish Hydraulic Institute and Aalborg University which is the most experienced university in Denmark regarding testing of maritime structures. Crestwing is situated in the municipality of Frederikshavn, which is historically a maritime center with shipyards, engine manufacturers, a well equipped harbor and one of the largest ports in Denmark. The municipality is also home of Energy City Frederikshavn, who has been a close partner to Crestwing for more than 10 years, supporting with network, competent feedback and “opening doors”. Energy City Frederikshavn is a municipal business development project, who among other things promote and facilitate projects creating green growth and new, local jobs in the energy sector. - From the very beginning we have believed in the perspectives of Crestwing’s energy converter. It’s a sustainable idea which also happens to match our municipality’s ambition about green growth and new local jobs in the energy sector, chief consultant Bahram Dehghan says.